Muse natural cat food takes mealtime to cat-worthy heights by combining the natural nutrition your adult cat needs with the taste she loves. So much deliciousness, your cat will get Musebumps! 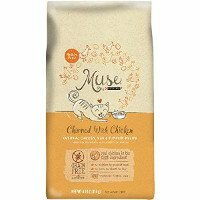 This grain-free and gluten-free, natural dry cat food is crafted in the USA in Clinton, Iowa with real chicken as the first ingredient.